A man sits in the driver's seat of a stagecoach in Charlotte County circa 1905. This photograph comes for the Harry Mallory Photographs collection of the Provincial Archives of New Brunswick (P391-25). "Here she comes and right on time." The arrival of the stagecoach was the highlight of the day. The people gathered at the depot to greet travellers and to await the opening of the mail bags that might contain news from families. The coachman was an ambassador, gathering up local news enroute, good Samaritan, a tourist guide, a gentleman and honourable in all his transactions while enroute. The description of the following routes may not be accurate but present a picture of the area they served. The coaches were strongly built, the body suspended on heavy leather straps attached to the framework. The first stages were closed, front and back, but the sides remained open with a curtain to protect the passengers from inclement weather. In later years the coaches became enclosed and seating arrangements were made more comfortable. The coaches were adorned with added features and brightly painted. The larger coaches were drawn by six horses, the smaller coaches had two or four horses. Inside there were three rows of seats, each row wide enough for three passengers. Those sitting in the front had their backs to the driver; the middle row was swung on a pivot to allow the doors to open. Some coaches had a fourth row of seats for passengers on the top of the coach behind the driver's seat. (Quote, Canadiana 9, page 390). The stagecoaches were the only means of long distance inland travel before the arrival of trains, although this type of travel continued long after the trains made their appearances. In 1830, James Brown, Tower Hill, N. B. was elected to represent Charlotte County in the Provincial Legislature. In 1838 he was appointed Government Supervisor of the "Great Road" from Fredericton to St. Andrews, N.B. Honourable "Jamie", as he was called, surveyed other roads within the province. He was a member of the House of Assembly for 34 years. During his years in government he travelled from Tower Hill in winter on snowshoes and in summer he walked or went by stagecoach to Saint John and up river to Fredericton by river steamer. The stage averaged about 5 1/2 to six miles per hour. Stops were frequent, more out of deference to the horses than to the passengers. "Post houses" were found about every 40 miles where passengers could rest and find refreshments; and here, horses wereh changed, allowing fresh teams to continue the run. Passengers travelling in the winter experienced some discomfort. The 'winter coaches" (on sleds instead of wheels) made travelling conditions slower and averaged around 4-4-1/2 miles per hour. In 1769, a trail was blazed from Frederiction to St. Andrews by Lt. Garrett Clopper and Capt. Stair Agnew. They were officers of the British Army during the Revolution.The road ran from New Maryland to Tracy, then to Piskahegan, Pleasant Ridge, Rollingdam, Waweig, and followed the road along the St. Croix River to St. Andrews, N.B.. This road came to be known as the "Stagecoach Road". Many of the other roads constructed were also known as "Stagecoach Roads". On the On the "Old St. Andrews-Fredericton Road" (Great Road, Stagecoach Road), a popular stop was "True's Post House and Tavern", not far from the blockhouse, built in 1812 at Piskahegan. The story of the "Old Road" would not be complete without the life of Josiah True. Josiah True came to the area about 1810 from the United States; became a Canadian citizen on May 25, 1810. He petitioned the New Brunswick government for a lot of land and received a grant of 200 acres. Robert Pagan, Hugh McKay and Joseph Porter, men of influence at the time, were witnesses to his success. He cleared the land and erected a home and enjoyed a prosperous life as a farmer, lumberman and proprietor of True's Inn and Tavern. There are many tales of piracy, theft, and highway murder that passed down through time of the ill-gained wealth he acquired. No evidence was ever found to support such criminal behavior. Josiah True was an intriguing figure in the early history of Charlotte County and his presumed hidden wealth "True's Gold".Gold bars were supposed to have hidden wealth under a rock or in the basement of the True home. To this day no gold has been found. He is buried in the St. George Cemetery but his resting place and the burial places of his wife and son are unidentified. The following poem was written by Daniel Stewart, Oak Bay, when he was in Grade 5 at the St. Stephen Elementary School (worthy to be included in the story). Permission given. You'll solve the old mystery of the buried gold. If you visit at midnight when everything's cold. That were sneaked upon, robbed and the shot with a gun. Some say sky lights will guide you to True's abundant treasure. The reward you will find may grant you such pleasure. Those snakes may catch you and drag you under. The firm of Hardy & Bridges opened a stagecoach line in 1854 with headquarters in St. Stephen. Their living stable was on King Street in the vicinity of the Guardian Drug Store. Thomas Hardy was operating a stage run between St. Stephen and St. Andrews when he was joined by Isiah Bridges from Pembroke, ME. and formed the partnership of Hardy & Bridges. Mr. Hardy began driving stage at the age of 18. Previous to the constuction of the railway from Vanceboro, Me. to Saint John and Fredericton, Hardy & Bridges carried passengers and mail between St. Stephen and Fredericton for 12 years. The service started with one round trip each week. Later, two trips were made and then three trips. They owned two coaches: one carried six passengers and the other, nine. They left St. Stephen in the morning and reached the capital in the evening, returning the next day. The partners drove the route themselves and later hired W.E. McAloma and John Beck. The fare was $4 and as high as $7 for a round trip. It was not an uncommon occurrance for them to carry $5,000 for the banks or the government, but not one cent of these funds ever went astray or delivery delayed. The stage left St. Stephen, proceeding to King's Mast Road (Old Ridge), following on Route #3 towards Branch Stream, taking a sharp left turn and travelled through the woods crossing the Kaine Road at the top of Gibson Hill and back on Route#3 to Lawrence Station through Broackway, Tweedside, Harvey, Hanwell Road to Fredericton, N.B. A way station, operated by a Mr. Pattingill, was located at the intersection of Route #3 and the Baseline Road. In 1904, competition was keen and business began to slow down. At this time they decided to close their business, having operated for 50 years. Mr. Bridges died in 1904 at the age of 72 and Mr. Hardy died in 1911 at the age of 92. 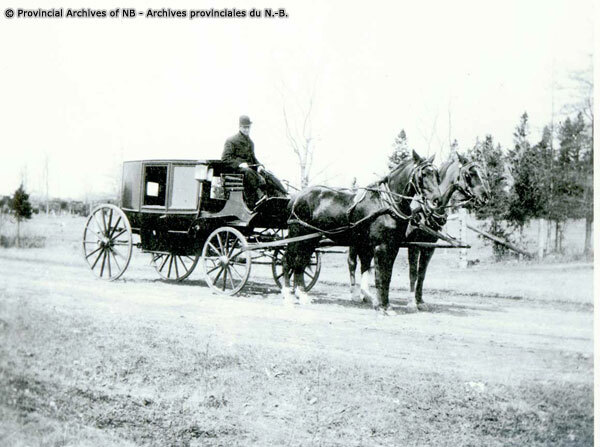 Hardy & Bridges purchased all their carriages from B. R. Dewolfe Carriage firm in St. Stephen, N.B. Joseph Leavitt was a stagecoach driver on the "Old St. Andrews-Fredericton line". In 1842, Robert Dougherty of St. Andrews operated a mail and stage service to St. Stephen. The stage left St. Andrews and followed along the river to Waweig, crossing over the bridge at Waweig to Oak Bay and ferried across to continue through the Cleland Road to No. 3 Highway, following the road to St. Stephen, arriving at the station on King Street (formerly King's Mast Road). Another line left St. Stephen and travelled through the Hanson Road, crossing Route 735 on through the woods to the Mill Road, following the valley between Pomeroy and Scotch Ridges and crossing the Truck Route at the foot of Hoodley Hill, continuing to Pomeroy Ridge near Mocassin Swamp and crossing the St. Croix River at the foot of the hill at Clarks Point on the ford, then to Enock's Stream to Topsfield, Me. This line presumably may have been operated by Hardy & Bridges. A post house was located in the valley between Scotch and Pomeroy Ridges in back of the home now owned by Terry Mehan. In fact, some of the construction of the home was part of the former station. A stagecoach service operated from St. Andrews, N.B. to Saint John, N.B. The station was probably the Mallory Stables on Water Street, St. Andrews, N.B. The line ran from St. Andrews through Bocabec to meet the old Saint John highway to St. George N.B. A post house was located in Bocabec near the Foster home. The station in St. George was the Clinch House on Riverview Ave.
Leaving St. George, the stage travelled eastward past the Cold Spings where the Gypsies used to camp, to Spinney's Corner. A post house was located here for the convenience of the passengers and fresh horses acquired. The horses were kept in James O'Neill's barn. The story is told that each horse had it's name over a stall. After acquiring fresh horses the stage followed the old Saint John road up Catergory Hill to Camp Utopia. About three-quarters of a mile further the road crossed part of Hunter's Bog to higher ground at Woodard Lake to Bishopton Inn and Water's Tavern. The road continued on to New River and Saint John. The distance from Saint John to St. Stephen was 88 miles. The stage left Saint John three times a week with stops between Spruce Lake and St. Stephen. The stage left early in the morning, reaching St. Stephen about 15 hours later, including stops. The travelling speed averaged about six miles an hour. To service the residents in the Harvey-Brockway area, a stage left Fredericton travelling on the Hanwell Road to Harvey through Tweedside and crossing the iron bridge over the Magaguadavic River to Brockway, stopping at the post house owned and operated by Solomon Vail, for a change of horses and for the passengers to obtain refreshements. The road continued south to Dead Water Brook and proceeded up the road leading to the landfill to connect with the Old St. Andrews Road to St. Andrews, N.B. Through the years, road were built, stagecoaches became the preferred way to travel. Other traffic was the ox-drawn wagons carrying unfinished logs for masts for His Majesty's Navy and travelled over rough wood trails. There were daily stages from Nova Scotia through Saint John to Calais and on to Bangor, Me. The first stage road followed the coast from Calais to Bangor. James Pike and other prominent citizens persuaded the Federal Government to open a new route and, in 1857, the "Airline" stage route between Calais and Bangor was opened. The new route was 25 miles shorter than the old route. The new route ran through wild and beautiful forests,passing open fields and farms. Passengers left Bangor at 9:30 a.m. and arrived in Calais at 3:30 p.m. the following afternoon. The old route was six hours longer. For some years there was rivalry between the two companies, both advertising extensively. The older company started stories about robberies and attacks by wolves and circulated posters showing pictures of such incidents. In the long run, the "Airline" became the chosen route and is now route to Bangor. The stagecoach routes were long; rough and hazardous but served the people well during their duration. A trip to Saint John or Fredericton was about 12 to 15 hours, where today the longest time is about two hours. The stagecoach era was an exciting time, don't you think?